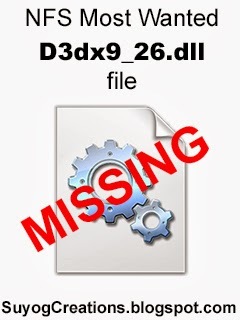 After such a long time we are uploading game file, so here we are with our new post on NFS Most wanted D3dx9_26.dll missing file. whenever you start your NFSMW game, if it show an error that "D3dx9_26.dll file is missing" then you are at right place to get solution on this problem. So now you need to download this missing file from our site. follow the given steps to download the file, once you complete the download paste the downloaded file in your game folder. Now your game will not show the error and you can enjoy your game. Click Here To Download D3dx9_26.dll file for NFS Most Wanted for Free. In That New Tab Click On "Skip Ad" At Top Right Side Of Your Screen. i deleted NfS MW 13 Exe file.. so what I do now? You can use data recovery software like Power Data Recovery to recover .exe file. if it doesn't work you need to download the game again.